I had to brave the town center today, which is never a good start to the day. On the other hand how else am I going to post my quilts? It's been a while since I was there, probably about 3 months, and in that time is has changed again. There are more cheap shops, more street traders and more mess. - Interlude, there is a program on the television about Leonardo Da Vinci. They started by saying that people can only be good at art or science. Leonardo is the only exception. Pardon? I know a lot of artists who are also scientist, and I would say the best scientists I have met are good because they have a creative streak. Maybe this means all of us who can do both will be as successful as him? Lets hope so. Anyway where was I. Ah yes the decline of Harrow. The most annoying thing for me is the complete lack of manners. I know I just make myself sound old, but when I was a child running into a lift, crashing into someone already in there and causing them to drop things would have been an issue to my parents. Sadly not anymore. After I pointed out the problem to the parent, they did ask the child to apologize, which it didn't do, but neither of them helped me pick up my packages. Having posted my packages I tried for lunch. I am standing in a queue when a young lady walks up to the front of the queue and asks the server, "Got barbecue sauce?". The chap serving replied "yes" and her hand shot out palm up. Well, clear I suppose, not entirely polite, but she had probably just finished standing in this very long queue and was irritated by forgetting the sauce. When I got my food the only clear table happened to be next to this young lady. She was eating food from another stand, so she hadn't been to that shop at all she had just wanted their sauce. Seems a bit mean not to give them any money then not even treat the staff politely. I had to get home. I find watching humans very depressing, if I stay home I just get to talk to you guys, much more civilized. As you can imagine I now needed to create something to take my mind of the world outside. This is what I came up with, I am not sure how clear it is, I guess some of you will tell me. Can you see what it is? I do rather like it but there are limitations. I used a faux trapunto technique with 2 layers of 6oz wadding. I don't feel it is fat enough. I really like the effect I got with 'Skelehand'. Is it possible to make faux trapunto that fat? The thread is a very subtle pink, which works really well in real life but not at all in the photos. I am going to have a go at doing a dark version, with black fabric and red thread. I will also try putting in more wadding. If that still isn't enough I guess I will have to go back to stuffing everything properly. Proving that quilting really can make the world a better place, well it calms me down so I see all the good things. I collected a fantastic writing/drawing board from a nice lady in Hammersmith via freecycle. If you haven't heard of it I strongly suggest google. It is an effort to keep usable items out of landfill by giving them away to people who want them. On arriving home I found that Bonnie McCaffery had put up her VidCast, and I make a very brief appearance on it. She has given a quick overview of the show at the NEC. Disturbingly there are several things on her video I didn't see at all. I know she was at the same show as me, so I can only assume I missed a lot. It always happens but I thought having spent four days there I might have seen most things. I have to admit to being very chuffed that she likes my quilt enough to want to put it and me on her video. Suppose I had better go and finished the background quilting on the new one. I must like stress and pressure. How else can I explain the fact that I always finish a piece just in time to get it to a show. Still it is done now, and I can post it tomorrow. I've been saving up packages for a mass posting tomorrow, when 'Unraveling' will be off as well. 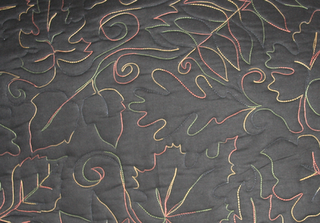 'Golden Storm' is going to Hever Castle for a show organized by region 2 of the Quilters Guild of the British Isles. The theme is Autumn splendor. For me this is what autumn is all about. Leaves blowing around. The leaves are actually very three dimensional, they look like they are about to fall off the background. In fact they are very secure but I wanted to capture the feel of them blowing about. The narrow brown border is free as well, as it is an insert like piping in the binding. I hope I am going to have time to go and see the show, and ideally pick the quilt up. I have been given number 36 for my quilt so hopefully there will be a good display there and I love castles. The show it on the 8th to the 10th of September. The ticket says it will admit one to the exhibition and the grounds of the castle, so I guess it is in some ancillary building rather than the castle itself. If anyone is planning on going and interested in meeting up, let me know. Today I feel I can call myself an artist. A piece of work I designed and made with no new owner in mind has sold. For me that is the definition of an artist, someone who can make what pleases them and others will want to own it. It is a very odd feeling, the piece that sold wasn't one I thought would be popular, and I expected to have it sitting here for a long time. I am thrilled it has gone to someone who will love it. The lady who bought the globe has a love of maps, and would have liked to have been a cartographer. Just perfect. For those who have asked, yes I did take a lot of photos before it went. Yes I will be making more spherical quilts. Yes I will be preparing patterns and classes based on my spherical quilts. Yes I am an artist, can I still be a scientist too though. Today was my first proper day of work since the exhibition, and it felt good. 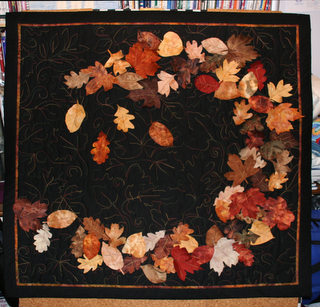 I've got all the leaves sewn now, and most are pinned to the quilt. 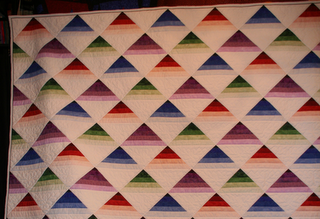 The quilt has borders/binding as well. I think of it as the borders but is really a very wide binding. I don't think the technique actually scaled too well. The binding fabric tries very hard to distort as you sew down the second side. Still it looks OK and for a quilt put together in something of a hurry I am pleased with it. I've also started on my art education. At the NEC I took a class with Michael James and he talked about a lot of artists we 'should' know about. I don't, yet. I've been bidding on cheap art books on eBay and the first one arrives today. It is all about Victor Vasarely. I can see why I should know about him. I am really enjoying reading about how his art started and then evolved. I also love some of the designs he came up with. I didn't realize how much I could learn from how someone else developed their style, but now I do you can be assured I will be reading more on this subject. I still haven't dug out the notes to check the details of the things I am supposed to look up, but I think if I work from what I remember and then follow the leads those give me I will do pretty well. I already have a lost of half a dozen other artists I want to find out about. I think i have learned something today. I should not announce to anyone, even myself, that I am planning a restful day. It is just asking for trouble. I am at Shakespeare County raceway theoretically watching Tet race and taking a few photos. No chance. The car Tet drives runs in two classes. Normally there is a reasonable gap between these classes so you have time to let the car cool down and refuel it. Today they chose to run them right after each other, so the car goes down the track and almost straight back to the start line. Well i an sure you have seen the pit stops done by circuit racers. I have spent today trying to do much the same thing. It was fun but not quite as relaxing as I had planned. On the way to dinner we spotted warwick cathedral. Given it was still light after we had eaten I got a chance to in and take some photographs. It is a great building with lots of architectural details. Even the wall around it is fantastic, with lots of different doorways in it. There was even a gateway into a garden. Lots more images to use in my work. Today I took a friend on a mystery outing for her birthday. Being short of cash donating time seemed like the best option, and by luck I found out about a free event she would really like. A corvette Stingray cruise at the Ace Cafe. I know it's a bit strange but she loves them, and would have the chance to take pictures so off we went. She was indeed very happy and took plenty of pictures. Strangely (given I have been looking at cars like these for years) inspiration struck. I've come away with not one but three quilt designs from various parts of the cars. I think they are going to be quite abstract but that seems to be something that is attracting me at the moment. I am looking forward to getting them drawn up tomorrow. From there we went to our local quilt shop. It isn't very local so she can only get there if I take her. It was a fun visit and for once she managed to spend more than me. Even better the support gloves I had been after were half price. What a result. I even managed to restrain my purchases, just what I needed for the next 2 quilts I am working on. Finally as it was a bit early for dinner we took a quick trip to the RAF museum in Hendon. I love going there to visit the Vulcan, and again it is free. Surprising how much you can do for nothing if you look around. They have been moving things around since the last time I was there so we got to see a lot of things I didn't expect as I hunted for the Vulcan. You wouldn't think they could hide something that big but they had. I've spent a lot of time with this plane over the years, but suddenly it was inspiring. I can see how to render it in fabric. It is just such a fantastic shape, I know I can express it's elegant design. I am hoping that with some thought I will come up with a second design that will capture the feeling I get sitting under it. I feel safe, like a huge bird is protecting me with it's wings. I can't see how to manage that yet and still have it be obvious what it is, but maybe it will come with time. Some kind of nesting Vulcan perhaps. At the museum they also have a Halifax, which has fantastic shapes in the internal structure of it's tail. I've already drawn up the quilt it has given to me. Wandering around aimlessly we came across a display about in air refueling. It is an interesting image, two planes joined together like that in mid air. For me though the really interesting part was the refueling rig itself. It has a delicate lacy funnel on the end. It reminded me of a chandelier. I am wondering if I could make a sculpture based on it. My final design for the day came from a Wellington, it has the most fantastic structure of spars in it, I can't quite see how it will translate yet, but I know it will. All in all a very productive and enjoyable day. My friend enjoyed meeting the Vulcan and I suspect will now be paying it occasional visits too. Given this quilt only existed in my head yesterday morning I am quite pleased with my progress. As you can see I have the quilting done for the background. 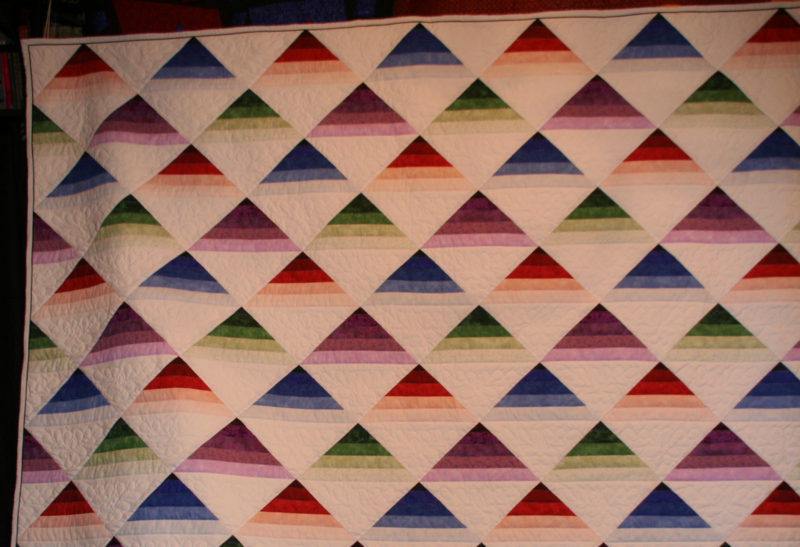 It is a really nice pantograph by Sophie Collier, Sew-Phie Quilts. It is called 'Falling Leaves', and is described as a complex pattern. Never one to take advice I just had a go at it and if you take it slowly it is pretty straightforward. I think the way it is drawn really helps, the line is very clear to follow so you can't really go wrong. I've quilted about twice the area I need to I can cut the piece I like most. Hopefully I won't have too obvious a repeat once I have trimmed it. I think I have most of the leaves made, they are still in need of some details but I think they look pretty leafy. The really surprising thing is that they feel like leaves. They are 2 layers of batik held together with Misty Fuse. I really like Misty Fuse, and suspect I will be needing a second roll sooner than I had expected. It is just so easy to use and Esterita is right, you can use all the little offcuts really easily. Some of these leaves have leftovers in them. I think I need to put these leaves on before I make any more so I can get an idea of how many more I will need. So for the rest of the night I think I will be sewing veins. Apparently some people aren't sure if you are supposed to comment on blogs. My view is yes, please do. I love hearing from people, it lets me know I am not completely mad and talking to myself if nothing else. When I get positive comments about my work, they make me feel good all day. When I get a negative response especially one where the person can tell me what they didn't like and why, I get to learn something. I cannot get better at this without help from my audience. Your comments are, to me at least, very valuable. So go ahead and chat away. It was a fine plan, sleep late and do nothing much. The world had other ideas. I've made good progress with my entry for the Hever show. I should have started it before I went to the NEC but somehow it never quite happened. So now I need to make a quilt from scratch in less than a week. Whups. On the other hand I have done all the design and planning for it so it is just the making I need to worry about. 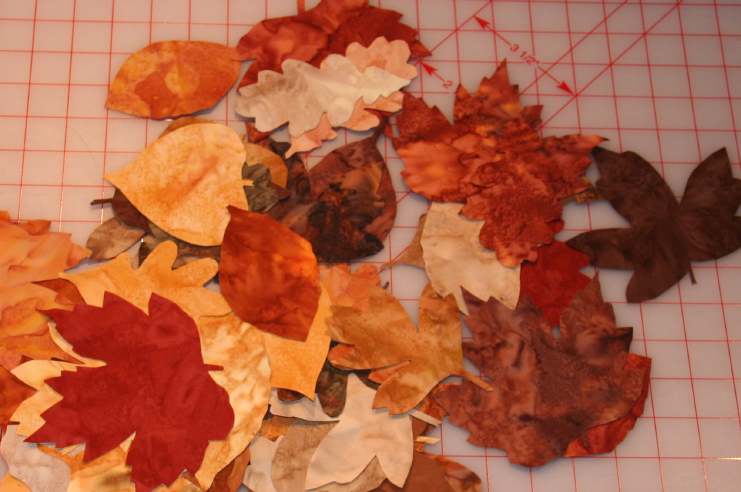 The theme is autumn glory, and I am making a wave of leaves. It will be called 'Golden Storm'. I plan to make it very backwards. I will start by quilting the quilt, then bind it. I am going to use a very wide piped binding, so it will have the look of a border and no binding. Finally I will add the leaves. I want to hold them down with the minimum stitching so they still move and are more three dimensional. I think I will need about 100 leaves. The quilt will be 1m square and I am making the leaves life size. I think I have cut about 60 leaves today, but they still need their details stitching onto them. A great day to dye. I can't believe how lucky I was yesterday. I had planned it as a day to do a lot of dyeing, a couple of weeks ago, with the intention of moving it if the weather didn't play ball. I have to do all my dyeing outside, there isn't room in the kitchen. So we have had torrential rain for the last 4 days, it wasn't looking hopeful, but then yesterday was a lovely warm dry day. Who would have thought it? Even more bizarre, it has gone back to pouring with rain today and will continue to do so until at least the weekend. I am very grateful for that one dry day. I've managed to get all the fabric pressed and folded and I am fairly happy with it. It has all come out more muted than I expected, and I am not quite sure why. I suspect that I made some silly error in the maths. I also managed to dye two of my longarm test pieces. The larger one looks really good now it is all black and I think I will just finish it and use it. The other piece is smaller and I will save it to make a rag quilt. My plan is to use any and all leftover dye on test pieces so ultimately I can turn them into brightly coloured rag quilts. It is amazing what dye can do for all the odd colours of thread I use up when practicing. In the process I also got to see how the alpaca wadding stood up to washing. I always wash freshly dyed fabrics at 50 degrees minimum to try and get rid of as much excess dye as possible. The alpaca went through fine. It did shrink a little but not significantly more than the cotton waddings. Also the exposed areas didn't disintegrate. I should have tried running it through the tumble drier but I didn't think of it. Next time. At least I now know I can put it in bed quilts and still wash them. The quilt is the one I was talking about from the show. I would love to find out more about the artist. She is Russian and her name is Marina Mamonova. If anyone does know her, or any information about her work I would love to know. This was the first quilt to make me get my camera out and having seen all the competition entries it is by far my favorite. I've realized that a quilt show followed by your partners birthday followed by a friend coming round for a dying session isn't the best idea in the world. I am more tired than I was Sunday! I still haven't quite caught up on email, or snail mail for that matter, but I will honest. Anyway I keep thinking of things I had meant to post about the show. The juried competition Quilt 2006 apparently had in the region of 200 entries. Of which 7 were selected for the competition. I can see why mine didn't get in. It was nothing like the ones that did. On the other hand, I obviously did have a better chance in the other class. 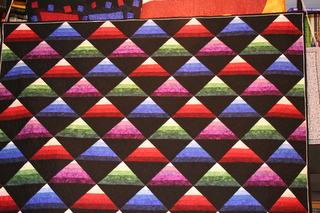 I can't believe that there were so few quilts good enough for Quilt 2006. I don't know if I will enter next year. It costs an extra ten pounds to be considered for that class and if they are taking so few, I can't see mine making it. It was really good to get the judging sheet back with the quilts. I guess they have the rule that every judges has to put a comment on every sheet, which is really nice as well. It gives you a feel for what the judge was really thinking. Some judges really didn't get 'Union Jack'. One commented that there was no need for gimmicks, but to my mind there weren't any. I just made my design which included aspects of punk clothing. Can I really expect the judges to know what punks wear? 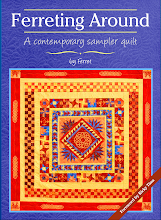 They all, quite correctly' commented on the fact that the quilting didn't go all the way through. This was because I had to put an extra backing on to cover the studs, they were too dangerous when exposed. I just have to mention the best phone call I've had in a long time. The lady who has bought 'Tread Lightly' called to confirm early on Monday morning. It was lovely to hear someone so enthusiastic about one of my pieces. I can't wait to see her and hand it over. I know it will be loved, I just wish I could see it in the middle of her dining table. It will be so imposing. Now I have to sleep, hopefully there is still some hot water after washing all the fabric I have dyed today. Hopefully I will get unpacked tomorrow and be able to upload some pictures. I wasn't going to mention anyone by name for fear of offending anyone I missed but I have to mention the two other bloggers I met up with, Penny and Caroline. 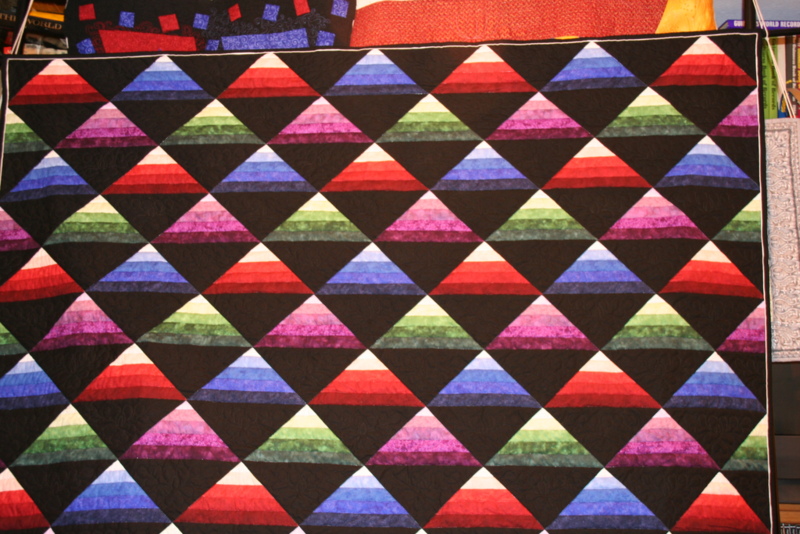 It is really fun getting to look at even some of the quilts with other people as you always get different perspectives. Given that both of these bloggers have mentioned me on their blogs I had to make sure it went full circle. If any of the readers of this blog have their own could you leave me a message so I can come and read what you have to say too please? I'd love to be able to follow what you guys are doing too. I'm pooped, and the cats are happy. I've made it home with all my quilts, luggage and purchases. Although I have definitely bought less than in the past. Maybe I am learning restraint. I did pick up some interesting things though. I finally have the equipment to do screen printing. This is something I have loved in the past and have been desperate to do onto fabric. I found someone selling everything I needed to get started and I couldn't resist, watch this space. When looking for discharge past I found metal paints. Not metallic, metal. It claims that the iron one will rust, this sounds really exciting and I am looking forward to playing. It is also very heavy, it really feels the right weight for metal. I've taken less pictures than in the past too. I found less quilts that really grabbed me this year. I don't know if that is a reflection on the entries or on me. I suspect the latter though. I am looking at thing differently now and thinking of very different projects. Last year I wouldn't have come up with half the ideas I have this time. One of the stars of the show for me was a monochromatic dancer. It was made by a Russian artist Marina Mamonova, sadly the only information in the quilt list is it's title, 'The Lacework of Dreams'. A very simple, yet to me very beautiful quilt. The other star was a slate quilt. Yes as in the rock, yes it was stitched. OK it did only have two layers, but they were sown together, and I loved them. This may be something I will have to have a go at in the future. The symposium was interesting, though not surprising. 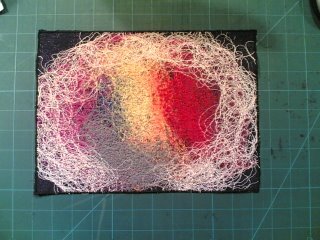 It might have been more so, had I not joined the quiltart list where a lot of the same issues have been being discussed recently. Simply put if quilters want to be seen as artists they need to be prepared to be judges exactly the same as any other artist, and the work must be able to hold it's own in that arena. We must learn to be more critical of what we make, and gain an understanding of what is going on in the larger art world, in the past, the present and the future. It was also very interesting to hear from galleries and museums. 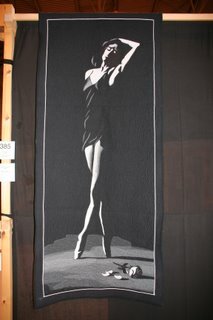 They do like to show or sell quilts but they are harder to sell than other art forms. Apparently pieces that are framed tend to do better as people worry about keeping quilts clean. They don't mind a sculpture getting dusty, or a painting that isn't behind glass but they worry about textiles. I wonder if this is because we are so used to cleaning our clothes and soft furnishings that they see it as something all fabrics must need. Nikki Tinkler has a new body of work, inspired by the Guggenheim. I found it very interesting and quite different to her other work. Having seen her quilts I would love to go and see the building in person. It is full of wonderful shapes and catches the light fantastically. Over the weekend I have met so many people. I know I can't remember them all but I would hate for anyone to feel I had forgotten them through any fault of theirs. I have a stunningly bad memory for people. Any of you reading this, it was great to meet you and I hope you get in touch. Especially all of those who spoke to me about this blog. It is nice to put some faces to the people I am talking to, for however short a time I remember them. I hope everyone got something out of the weekend, and I look forward to seeing you all again next year. As you may have guessed by this point the quilts at this show were handled very well. The quilt angels were great, as were the people hanging the quilts, taking down the quilts and judging. At the end of the show I was a little concerned to see the way the quilts arrived at the collection point, in huge boxes on pallets. However they had been packed very carefully into those boxes and were absolutely fine. They had been folded with the right side out and with the first folds horizontal. They all have their judging sheets with them as well when you get them back, no waiting or having to send off for them. If I was to be really picky (and I do mean really picky) there were a few things that could have been done better. I would have like to have had a table to repack my quilts on. Crawling on the floor was hard for me after being on my feet all day every day for 5 days, I hate to think how some of the others might have felt about it. It would have been nice if the venue could have let as stay on the chairs and tables until all the quilts had been collected. It would be nice if the collection point had been closer to the exit. Well where to start. I guess at the begining and carry on until i get to the end. I didn't post yesterday because i wanted a chance to think about what has been going on. Last night was the gala dinner, which is also the awards ceremony. Apparently this is the first year they made it an oscar type event. It kinda worked. The music was very invasive and not entirely appropriate, and rather than see some one struggling to get to the stage i would rather have had longer to look at the winning quilts. Still a nice idea and i think the nigh will probably be ironed out for next year. There were a lot of familiar names winning and some very good quilts. Then there were three nudes on the screen. My nudes! There on the screen, but not my name, someone else who sadly couldn't be there to collect the prize. At this point i stood up and shouted that it was my quilt. I went up and asked if it was the right. Second pictorial by the way. "yes this is the right quilt so that must be your name." "no my name is ferret." "it's not your quilt then. Believe it or not i do know both my name and my quilt, and i was very lucky. There was someone right there who knew it was mind. I was told to leave my name and they would investigate and get back to me. So i sat down and waited. Nothing. This morning (friday) i started trying to sort it out but no one knew who was responsible. Fortunately i an in the quilters guild and region 7. They weren't going to leave me to struggle and stepped in to help. A while later i recieved a phone call telling me who could fix it. Shortly after i had another call to tell me everything was sorted and i should to the office to collect my prize and certificate. Thank you quilters guild. While i was on the phone to the office they said they had a lady there who wanted to talk to me about buying one of my pieces! What a day. I am so thrilled. I had thought 'tread lightly' would be very hard to find a new home for but here it is with someone to love and care for it. What more could i ask for? Actually there is something else i would like. I would like to be able to tell fran jones how much she helped me. I found out today that she lost her fight with cancer about a month ago. I had feared that was the case when i couldn't get in touch with her, but i would have liked to have been proved wrong. However i also found out that she was at sandown, saw 'miss baltimore' and approved. The prize i won there was sponsored by her and i hope she realized that without her help it wouldn't have happened. She was so generous with her time and knowledge when things must have been very difficult for her. She will be greatly missed. Today was my first chance to look around the show. I didn't have a lot of time but enough to an and see all our entries. I feel that 'see sound' was my most effective piece. I saw several men explaining it to women. I saw people playing with it. This exactly what i wanted. I also need to extend my thanks to the quilt angels. They are doing a great job and going above and beyond the call of duty. They have been turning off my quilt every night to save my batteries. I wouldn't have dreamed of asking for this service, they have enough to do withou that but it is much appreciated. Thank you quilt angels. Please excuse any typos and a lack of capitals, i am posting from my phone and will make corrections when i get home. At least not until you have seen how they work. I was very lucky today, to be allowed to see them in action. I was invited to put some more air into the globe which is now at the festival of quilts at the nec but because of the poor signage it took me too long to get there and i had to wait for the judges to finish. They take a lot of time studying each piece. They try to see it from every angle and stand back to have an overall view. In the globes category there were three judges. They work totally independantly only speaking to each other when they couldn't find an exhibit. They have a helper who collects and collate all the forms. It appears that the forms are then studied and the winners selected. I got the impression that in the event of there not being a clear winner they then confer. From what i say they were taking their role very seriously and considering every mark and comment. It is nerve wracking watching your work being marked. I know they see everything. I hope that one of them gave me some pointers. One seemed to be writing a lot. I would offer advice on getting from the hotel to the hall but if you are here and in need of it i can't imagine you will have net access to be reading this. I hope i am the only one who takes the very long route. so excited, but I am a geek what can I say. Oh and if you see this, then it is working. Yay, it does work. Unfortunately I won't have spell checking or formatting, but I will deal with than when I get back. At least I will be able to tell you what is going on at the show. Oh and no pictures either, still it is a lot better than nothing. This would have been 'Bridge One' but I don't like the finish I have got on the edge of the black pieces, so I decided to use this as a test piece. I was worried that the quilting thread wouldn't show up enough to give the effect of rain, but I think with the long stitches it is pretty close to what I was after. I think a slightly thicker thread would be better but not so much so that I will wait for one. I've worked out a better way for me to do this sort of work and 'Bridge One' is ready for quilting. I also have two and three drawn up ready to start on. One of the classes I am taking at the Festival of Quilts is a critiquing class and I am planning on taking these and 'Skelehand' to be critiqued. I might also take "Bicameral Pierrot' as it is my worst quilt according to show judges and I would like to know why. I've come to really appreciate those judges that do give you suggestions on how to improve your work. Also if any of you have a hotline to the weather, can you order another heat wave starting Wednesday please? I know that 'Tread Lightly' got really hot in the car when I delivered it to the courier. Since then it has been quite chilly, so I am pretty sure it will be looking a bit limp. I am dreading seeing badly deflated and on show to so many people. I am staying in a hotel for the Festival and I noticed that they said the room has internet access. I thought this would be good, I would be able to blog while I am at the show, so we called to get details about how it works. Yes the room has a net connection (rare in this country) but there is a charge, wait for it, 15GBP per day! I can't believe it, that is less than most people pay per month. I know they want a profit but really. I would think that most people who do use the service only use it for an hour or two a day so it would be far cheaper to drive to the motorway services and use one of the terminals there. I am really shocked. I will check when I get there in case they have got it wrong, but if they are right the updates will have to wait until I get back. A while ago I submitted some pictures to Unlimited Possibilities for inclusion in their online gallery. I found out today that the pictures have been put up. I am very pleased, they are a long arm quilting magazine and it is pictures of 'Tread Lightly' they have put up. A bit of a departure from norm. 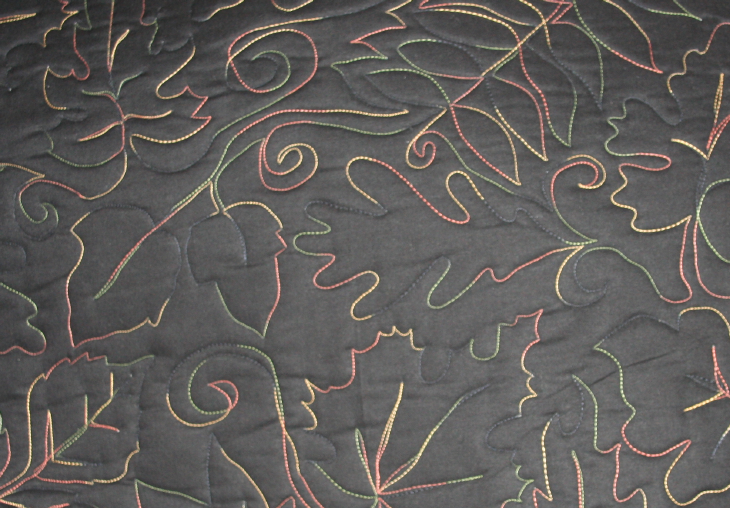 I think it is great to have other ideas of what can be done with a longarm quilting machine. If you fancy having a look here is the link, Unlimited Possibilities. I've only had one copy of the magazine so far but it looks pretty good. I believe they have just got a new editor, who seems very keen so hopefully it will go from strength to strength. 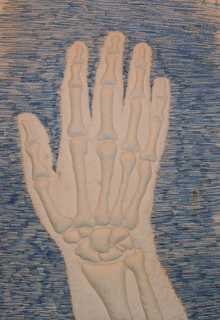 I've finished the quilting on the skeletal hand. I was very pleased with it. Then I rinsed it in clod water to remove the vanishing thread and discovered that at least this part of my roll of alpaca blend isn't exactly clean and leaves dirty marks on the surface of the quilt. I am guessing it will be OK with dark fabrics and in projects I don't intend to wash. I am in two minds about this wadding now. Should I keep trying with it? Is this just a very dodgy bit? If anyone has any experience with any alpaca blend waddings I would really appreciate some more views on it. It feels great and should be very warm, but if it is going to leave dirty marks I don't honestly think I can use it. I certainly can't offer it to customers. I've been finding that doing a lot of quilting on my longarm means I have very painful legs for a couple of days afterwards. Today I bought some anti-fatigue mats. They seem to do the trick. I've only done a few hours this evening but my legs and feet feel very different. For eight quid I think they are a great investment. Of course the real proof won't come until tomorrow, but I think it will be fine. On the other hand concentrating too hard on making small repetitive movements is hard the shoulders, so I took a break to show you what I am working on. I've been trying to work out how I can 'sculpt' images. I want to make nudes in 3D somehow. I've been playing with some faux trapunto, and stuffed applique but neither has given me the look I want. To try out this technique I wanted a simple distinctive image. The x-ray is perfect, for what I want. 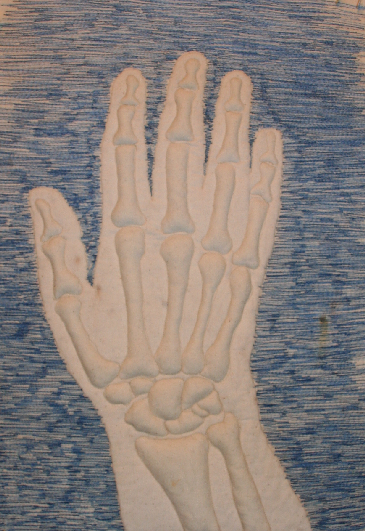 The flesh of the hand is faux trapunto, and the bones traditional trapunto. It has given a lot of depth to the image. To give even more definition to the hand I am using very dense quilting. It also allows me to 'paint' the background blue. 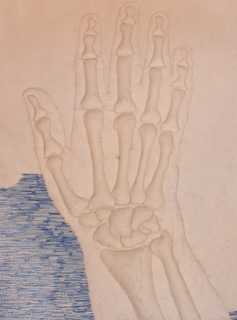 After completing the trapunto I decided I wanted it to look more like an x-ray, and to me x-rays are blue. Should I quit the day job? Artist often seem to ask themselves if it is time to leave the rat race and try to make a living from their art. After listening to a lot of discussions on this subject I think I have a really simple test that will give you the answer. I have just spent the morning sorting out my accounts. I got behind while I have been getting quilts ready for shows. I think I have another half days work to do, and then I have to file my tax forms. I've somehow managed to lose 2 critical pieces of paper so I am going to have to beg for duplicates. I thought I had been so careful. On the bright side I only seem to have lost one receipt in the whole year. Yay me. Now I can't tell you this has been fun, but would I swap it for a corporate job with a safe (and good sized) pay cheque. No way. Every time I felt frustrated I remembered what I am not doing, smiled and carried on. I think this is a sure sign you should quit the day job. If accounts, tax forms, and missing paperwork can't convince you this is the wrong path, I can only assume it isn't. I've finally finished my first quilt for Ami Simm's auction. I've had it underway for a couple of months but somehow it just wasn't getting finished. Strangely it was the same problem I was having with the purple bubble quilt. I couldn't see a binding on it. This one I solved with the other technique that had been discussed on the quiltart list. I used a satin stitch. It has the right feel for this quilt but I can't see me using it again. This quilt is called 'Unraveling'. I was given a stack of bobbins which still had some thread on and I needed to empty them. Given I didn't know the composition of the thread I wasn't keen on using them for quilting. So I started just winding the thread off onto my desk. It felt wrong, the thread didn't want to just be thrown away, but what was it good for. You know how mindless tasks are, you start thinking about all sorts of things. Suddenly I had it the thread was so like people were describing Alzheimer's. It had so much more left to give but somehow couldn't quite get everything together, like the minds of sufferers it was unraveling. Hopefully it will go on to have a productive and appreciated life. I will post details of the auction when it is up. The next auction starts the 1st September, there have been some great quilts and all sales raise money for research. The auction can be found at Ami Simms web site. 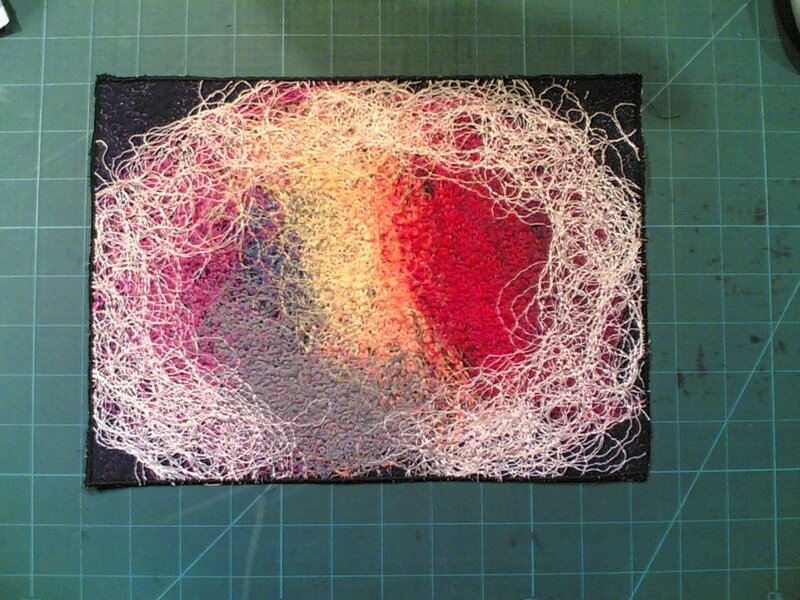 'Tread Lightly' is about 70cm in diameter. The internal structure is an exercise ball, currently full of air. Unfortunately this is very sensitive to temperature changes, so when it comes back I will be filling it with expanding foam. The patterns for the globe is based on a cardboard globe from Greaves and Thomas. They are an old map making company who really know their stuff. They sell these small flat pack globes for those who can't afford their large ones. The pattern didn't come out quite right for me, but a globe is very easy to do fitting on compared to a human. I stitched the skin, fitted the ball, checked how much slack I had then took it apart and re-sewed it. The top of the globe had to be hand stitched closed with the ball partially deflated to have room to hold things together for sewing. I've also embedded a magnet in the polar ice cap. This means I can attach things like show information without using pins, which would be dangerous to the inner ball. If you have any more questions, leave me a comment and I will add to this post for you. Everything is so obvious when you've been working on a project so it is easy to forget interesting details. I seem to be making progress with my plan to clear the decks. 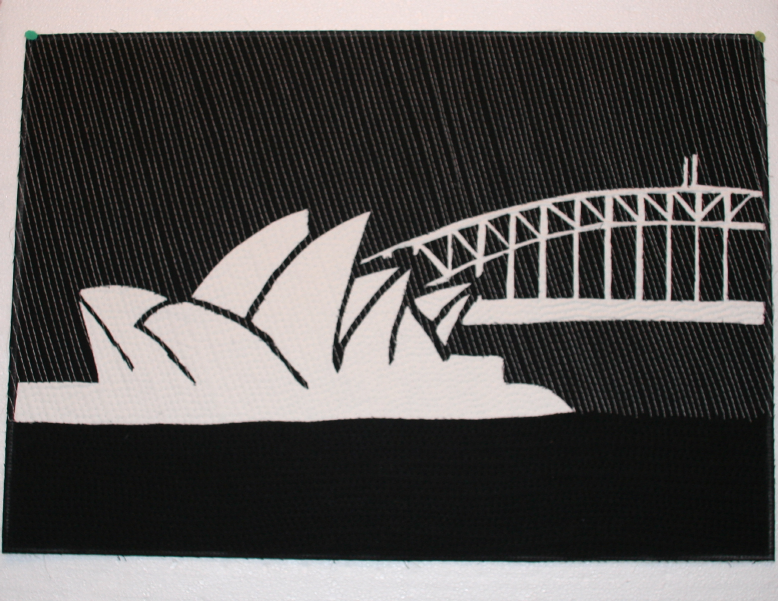 This piece was started in a class with Pat Deacon, at the Quilters Guild AGM this year. It was a very interesting class and I had hoped to get this finished during the weekend of the AGM. I very nearly managed it so it made sense to put a binding on it and get it out of the sewing room. There was a discussion recently on the quiltart list about no show binding, and this seemed the perfect time to try it. I couldn't find any more of the fabric I had used in the quilt (who will bet I trip over it in the next 10 minutes) and I couldn't find a colour of binding I liked. The facing was surprisingly easy to do, and I rather like the effect. I can't see it being the right solution for everything I do, but when I can't find a good option for the binding I think this will be my solution. In the class we were asked to not fiddle with the design, just draw certain elements and then make it. As soon as we were told what to do I know I wanted to have a feeling of bubbles. I don't think I got it quite right but for a first attempt I am pleased. I haven't had much time for quilting today, but I did get a chance to re-learn an important lesson. There are bad guys out there and they are looking for you to be careless. I was having lunch with a friend in a restaurant. We had laughed at the fact neither of us wanted to sit with our backs to the room and that we both carefully tucked our bags onto the bench seat between us. We are so paranoid. It was a very quiet lunchtime there were only 3 tables with customers. Suddenly there was a commotion at the table directly in front of us. The older lady had lost her wallet. Their table was a right in front of the counter and maybe 3 steps away. There were staff at the counter and myself and my friend looking directly at her table. She had put her bag open on a chair and then gone back to the counter to get something while her daughter settled children at the table . In that time someone had come in, sat at the next table, reached into her bag and taken her purse. No one had seen anything. The counter staff were distracted by the woman herself and our view was blocked by the daughter. Impressive isn't it. If she had closed her bag, or kept it on her shoulder, or any one of a dozen things the thief probably wouldn't have had a chance. That moment of inattention ruined her day. There is CCTV footage of the theft it happened to have a clear view but is an old system and probably not good enough to identify the thief. Now for the real kicker, the lady then left her bag in the same place while her daughter was talking to the manager and went to the bank a few doors down the street. The bag was open with a mobile and all her ID clearly visible. Now I know I wasn't going to let anyone touch it, but did she? It doesn't look to me like they learned from this experience, I hope you do. I don't want to see thieves winning, let alone so easily. Here are the promised pictures of the PCB quilt. I am really annoyed with the chalk I used to mark the front. I keep washing it out and it keeps coming back. I thought about withdrawing it because of the markings but decided not to. Now I am worrying about it. Will people think badly of it or me because of the markings? Will it put them off asking me to do longarm quilting for them? Who knows? I suppose I just have to let it go. It has gone now and I can't change that. I think part of my concern is because it is likely to be fairly noticeable, and probably memorable. I thought I would show you the inside of the quilt. There is a lot of spare wire because while I was connecting it I wanted to leave myself a lot of options for where to hide the electronics. In the end I decided to embed the boards in the middle of the quilt to protect them as much as possible. The battery case hanging from the bottom of the quilt is made from a large cardboard tube, and contains 4 9v batteries. I think this should be enough to keep it going all through the show. I put a switch on the battery case so the lights wouldn't be going off in transit and in the hanging instructions I have asked that they turn on the quilt. I did call the organizers first to check this would be OK and they were surprisingly calm about it. In the worst case I can flick the switch when I get to see it. The last couple of days I had been looking forward to taking some time off, and doing something else. Now it comes to it I want to get back to work. Even if work happens to be doing a tax return. There are days when I wonder if I am doing the right thing. I think tax returns looking good answers that one. Before that I need to clear the decks. It is amazing how much stuff has collected in my work room while I have been going flat out for the show. I am discovering lots of projects I had to pause that I could now get done and out of the room. Also in the piles I've found my Sin City novels. I am planning a quilt in the style of Frank Miller. I thought a cityscape in the rain. I love his art style and I think it will work well in fabric. I've been playing with Misty Fuse and I think it will let me do some more detailed work. Maybe I should test the theory with a Frank Miller quilt. I've gone so far beyond tired it isn't true. There is no entry for yesterday because yesterday turned into day. Somehow we missed the bit where the sky went dark and we went to sleep. On the other hand if I can teach binding to someone tired, stressed and sore at 5am while I am in the same state, I guess I must be OK at teaching. It was an experience getting everything done, but finally it all came together, and the quilts made it to the drop off point with an hour to spare. I would say it wouldn't have been as close but for the oh so helpful motorway traffic. What you really need when lacking sleep is a jammed up motorway in the heat, yup really makes it easy to stay awake and alert. The 120 mile round trip took over 6 hours, I am amazed I made it in one piece. I am also amazed that all the quilts fitted in the car. Having two 3D quilts does take up a lot of space. I did take pictures of everything but they can wait until at least tomorrow, right now I need some sleep. I am already planning lots of new pieces, I must be mad. Night night. My copy of Popular Patchwork arrived today. Now I will probably be the only subscriber to say this, but it is early. I was expecting it next week. Why does it matter you ask? Well I am in it. 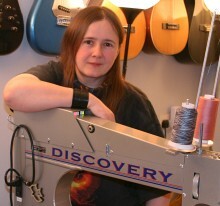 I was interviewed about longarm quilting, which is fantastic. 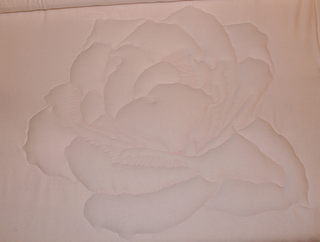 In the article it is mentioned that I offer a longarm quilting service, also fantastic. However, I'm in the last stages of trying to get my entries ready and delivered to the NEC, and I will be out delivering them on Friday. Not the ideal situation if potential customers are trying to get hold of me. Oh well these things happen. It has been a busy, tiring, at times frustrating, but ultimately very productive day. 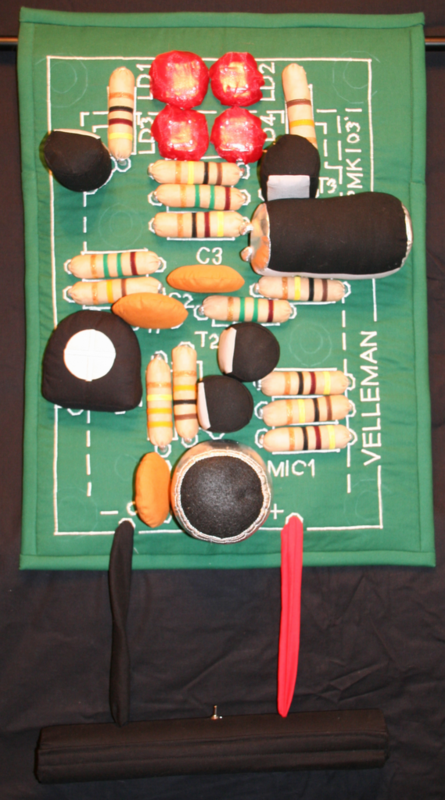 To start with I have managed to get a lot of the components onto the front of the quilt. I am really pleased with how well the capacitors are standing up. My resistors are much easier to read than the real thing too :) I have to make an R14, when I planned the components I did it from the parts in the kit rather than the list of parts. 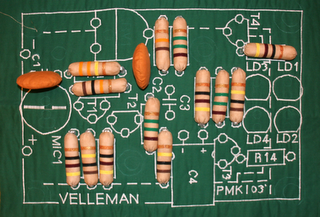 The kit was missing one resistor, and although I have bought a real one to make up the kit I haven't got round to making the fabric one yet. 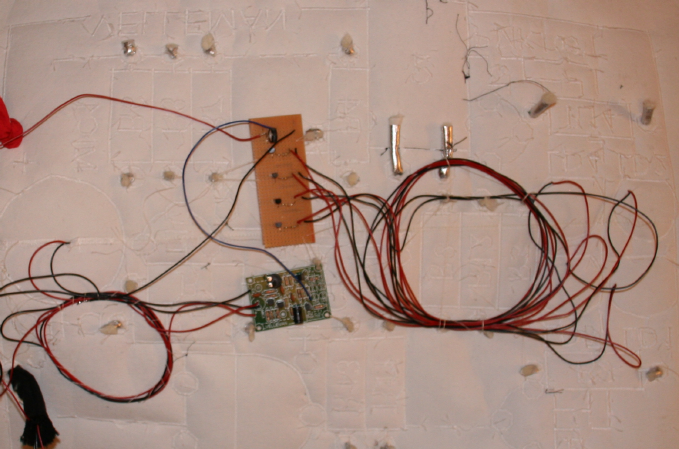 Either way this is definitely recognizable as the board in the kit so I am happy. This is the real thing. Not the clearest picture, but I am tired so it will do. You can probably see it has been adjusted slightly, this is because some of the component need to be spread around the quilt so have been put on spur boards. Finally here is the wiring loom for the quilt. 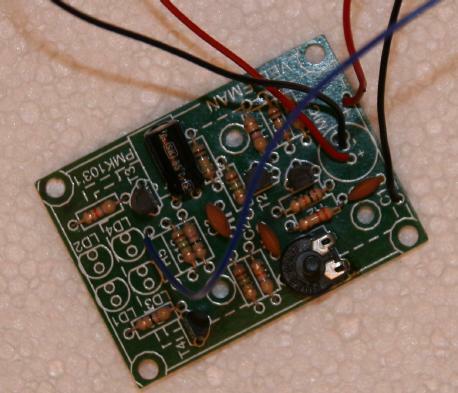 The four small square boards are the LED clusters. 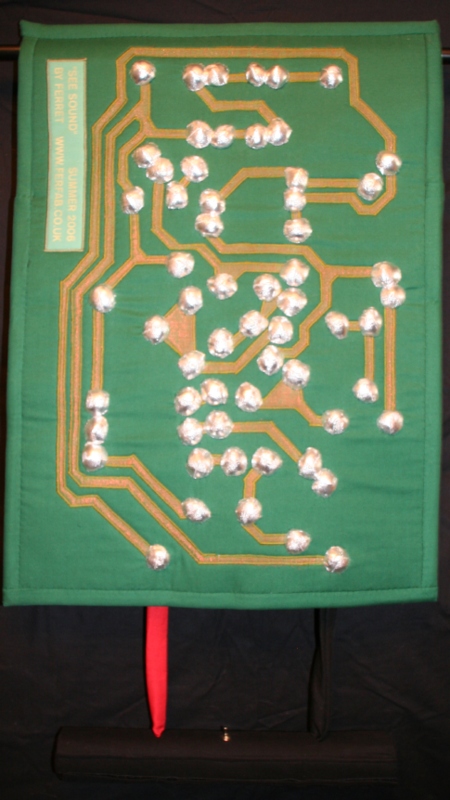 I have replaced each single LED on the original with four on the quilt. This should make them visible in the exhibition center. For some reason this very simple kit didn't want to play ball at all. As I have mentioned I felt I had a problem with the sensitivity of the microphone and I wasn't getting the brightness I wanted from the LED's. Bytepilot had been giving assistance but nothing was working. I simply wasn't getting the results we expected. Last night I admitted defeat, this wasn't going to work for me, I needed an man who knows and an oscilloscope. My DVM is great, but it isn't what you need for tracking audio around a circuit. We have spent the afternoon poking, prodding and talking nonsense to this board, but still it wouldn't play. We tried a duplicate, no go. Now remember these kits are supposed (and in my experience are) idiot proof. We decided that one of the transistors had died, the same one on both boards, so replaced it, and yay it did work. So how had we killed the first one? Had it been making it light just one LED? Nope. Was it trying to make it light many? No. Who knows what was wrong with it? It works now though and I am thrilled. It is far better than I had hoped after my first few attempts, the LED's are bright and the microphone is sensitive, it was showing us an aircraft going over earlier. Thank you Bytepilot. We have realized there may be another issue. It is sensitive enough to pick up noises when it is packed going to the show. The batteries probably won't last the two weeks it will be in transit. I won't be able to get to the quilt to changes it's batteries before judging. I am going to try calling the people running the show tomorrow and ask if, as part of the hanging process, they could switch my quilt on for me. I am not hopeful, given it is a rather odd request, and if they won't I have to find a way of it switching itself on when it is hung up. Could be interesting. We have had an evening of trimming de-linting and packing. 'Union Jack' is packed and ready to go as is 'Pair of Gems'. It is surprisingly tricky to follow all the packing rules and get all the little paper tags in the right place, but I think we have done it. You will have to excuse the quality of the pictures, it has been raining on off all day so I had to photograph them indoors. Also I can't get far enough away to fit the whole quilt in. I hope I will be able to get better pictures at the show. I think the quilt will look great against the white walls. You can't see it well in the pictures but the bindings each have a thin piping on them in the contrasting colour, it really makes them zing in real life. 'See Sound' is still causing trouble. I think I have blown something. The circuit has stopped working now. Fortunately I have someone I can ask to have a look at it with me, and that will be tomorrow nights project. During the day I can finish off the components and hopefully start putting them on the quilt. 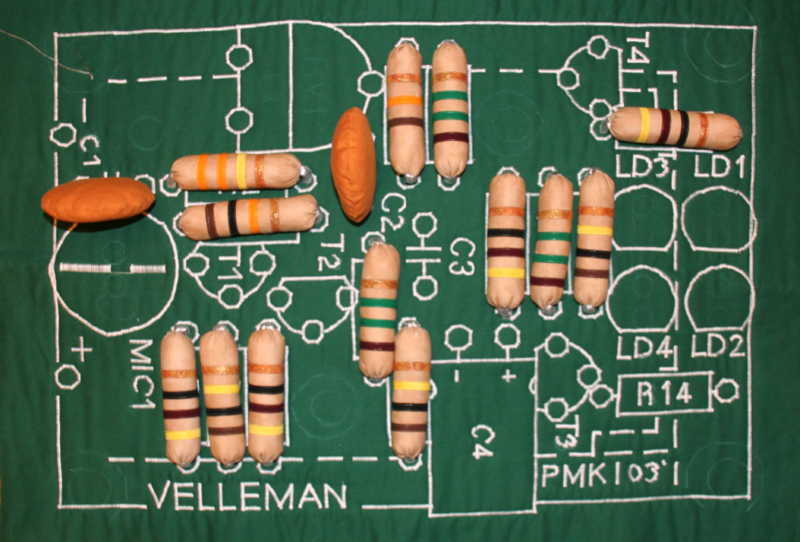 I am really looking forward to starting to built the fabric circuit. I've got a new project nagging at me. I want to make building blocks of art. Like children have blocks with letters on and can make words, I want to make cubes that stack together to make images or patterns. I also want the design to flow around each block. I think I am going to have to keep myself very restrained. I like to work big, but the logistics of big blocks just isn't worth considering for a first attempt. I think six inch cubes will be quite big enough for the first attempts. I know I will have to start drawing these up soon, every time I pause (even at traffic lights) if comes back and nags at me. So watch this space.